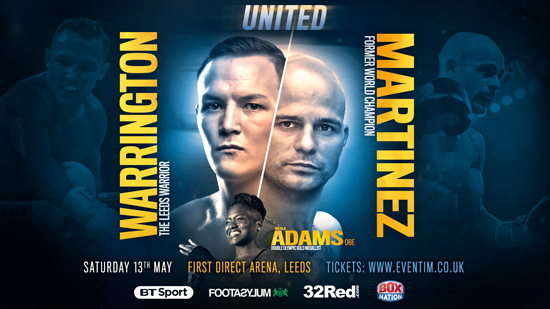 Leeds warrior Josh Warrington is stepping up in class in his hometown against former World Champion Kiko Martinez on May 13th. Warrington knows the Spaniard is several levels above anyone he’s fought previously but has supreme confidence in his abilities. Martinez, his 31-year-old adversary on the night, is the former IBF Super-Bantamweight World Champion and twice fought and lost to Carl Frampton. This is exactly the type of opponent Warrington will face with regularity on the World stage and one that he will need to overcome. “I’ve had 10 months since I last boxed, so it’s nice to come back against a big name like Kiko, he’s a former World Champ. “He knows what it’s like to be at the very top, he’ll cause me problems and he’ll test me. But if I’m good enough then I’ll beat him and I feel like I am good enough, I can go to world level. Chief support on the card sees Liverpool’s Jazza Dickens defend his British Super-Bantamweight title against highly-rated County Durham slickster Thomas Patrick Ward; Double Olympic Champion Nicola Adams OBE makes her highly-anticipated homecoming after kicking-off her pro career with a win in Manchester earlier this month. A stacked undercard features British Super-Lightweight Champion Tyrone Nursefighting in a ten rounder; undefeated Bradford Welterweight Darren Tetley; rising Guildford Featherweight Thomas Kindon; power-punching Fulham Super-Middleweight Zak Chelli; Guisborough Super-Lightweight Kalam Leather; fast-rising Southampton Featherweight Ryan Garner; Doncaster Featherweight and Warrington sparring partner Reece Mould; Leeds Welterweight Tom Young and the professional debut of Team GB amateur standout Joe Maphosa. Remaining tickets are available from Eventim at www.eventim.co.uk and 0844 249 1000.